This month we will be spotlighting SGMAH motors. 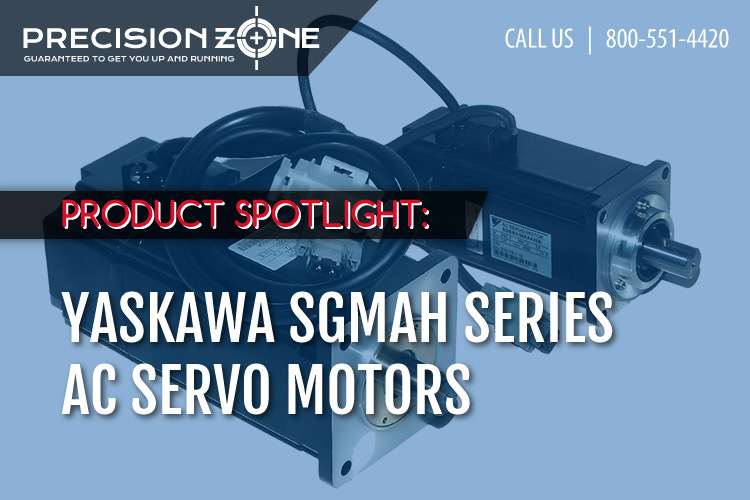 The SGMAH motor is part of the Yaskawa AC Servo motor line that can be with or without gear. The one that we will be highlighting will be without gear. This specific model is part of their Sigma II product line that also encompasses AC Servo Drives. The typical SGMAH motor model number starts with SGMAH but then there is typically 7 digits after that with a dash between the SGMAH and those 7 digits. Each of the digits has a specific meaning. The first two digits specify the rated output for the motor in watts (W) which then can be converted to horsepower (HP). The values of the rated output are between 30W and 750W. The third digit signifies the power supply needed for the motor to run and can be one of the three options: 200 VAC, 100 VAC, or 400 VAC. The fourth digit is for the encoder type. There are two types of encoders for motors, incremental and absolute. Incremental encoders only record the incremental changes in the position of the shaft whereas absolute encoders give the absolute position of the shaft at a specific time. For incremental, there are two types of bit measurement 13-bit and 16-bit whereas for absolute there is 16-bit and 17-bit. The fifth digit is for the rated speed of the motor. For SGMAH motors they either have an “A” for 3000 RPM or an “F” for standard revision level. The sixth digit is for the shaft configuration. There are 4 types of shaft modification. “2” is straight without keyway, “4” is straight with keyway, “6” is straight with keyway and tap, and “8” is straight with a tap. The seventh digit is any accessories the motor may have. In this case, there are 4 accessories for this motor. “1” is for a standard without the brake, “C” is for standard with brake (24 VDC), “S” is for standard with shaft seal, and “E” is for standard with brake (24VDC) and shaft seal. These motors also can cause alarms on their respective drives. The most common errors are A.71 and A.C9. A.71 is an overload error. This means that the motor is seeing too high of a load while it is in use. This could be caused by a few factors. The first is that the motor is either wired to the servopack incorrectly or a wire is disconnected. To fix this you just need to check that each wire from the motor is connected and connected to the correct terminal on the servopack. The second reason for this alarm could be that the load seen by the motor exceeds the rated torque. In this case, you would either have to reduce the load torque and inertia or replace your current motor with a larger capacity motor. The third reason for this alarm could be a defective power board in the servopack which you would either have to get the servopack repaired or replaced. A.C9 is an encoder communications error. This means that the encoder on the motor is not communicating correctly with the servopack. This could be caused by a few cases. The first is that the encoder could be wired incorrectly or is disconnected. To fix this you would have to verify that the encoder is wired correctly and that there are not misc-connections. The second reason for this alarm could be that the encoder is defective. In this case, you would either have the motor or encoder sent in for repair or you could replace the encoder or motor. The third reason for this alarm is that the servopack is defective. For this case, you would have to either send in the servopack for repair or replace the servopack.